Hello fellow domestic-savants. I have been planning to start this blog since the dawn of the blogosphere and have managed to procrastinate for almost 5 years! In the span of that time, I have decided that what I really want is to create a space where all of the people I know who are working for the man by day, but making pickles by night can discuss their various domestic pursuits. Here is where I plan to share my various exploits and I hope you will share yours. This entry was posted on September 22, 2010, 1:51 am and is filed under home. You can follow any responses to this entry through RSS 2.0. You can leave a response, or trackback from your own site. What a cool idea. Ich bin dabei! I’m quite interested in seeing this exhibit as I am about to design the cabinets for our kitchen. My problem (aside from a shortage of time) is that I cannot narrow down all the special design ideas I have: kick-board drawers for extra large baking sheets, separate drawers for forks, knives, and spoons, little inset hooks for dish towels that won’t grab ahold of me when I wear cargo pants, oiled milkpaint facing, friction-fit dovetailed drawers, compost bucket access from the top via an opening, and on and on. I fear that the exhibit will distract me with a new crop of ideas, but now I won’t start because I feel compelled to go so that I can get new and potentially better ideas. Thanks Domaphile. You procrastinated your very existence for 5 years and I’ve procrastinated my kitchen cabinets almost as long… now maybe longer. But seriously… looks like fun. By the by… I soaked the Shiitake logs overnight to encourage a fresh batch. We might be having that mushroom pizza after all. Congratulations, Heather! I ❤ domaphile already! 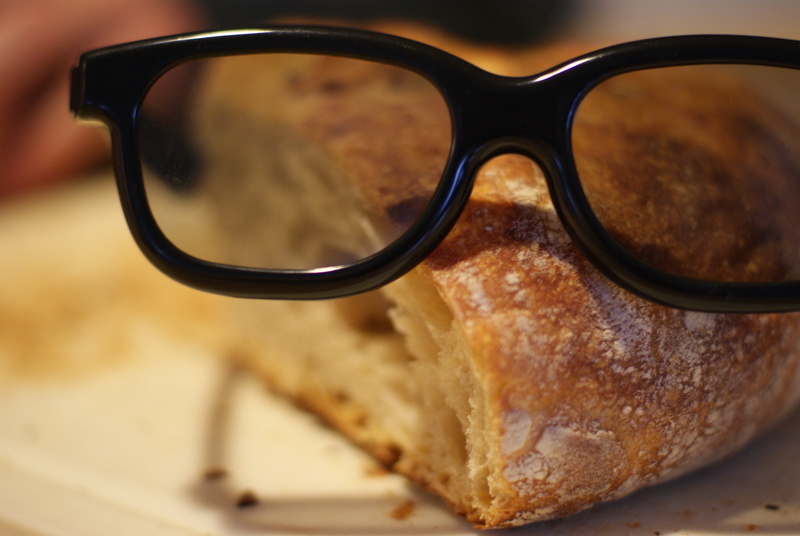 Is this the bread with the glasses the domaphile version of the Gene Shallit imitation?